New York : HarperCollins Children&apos;s Books, 2008. Pete the Cat. I Love My White Shoes / by Eric Litwin; art by James Dean. 100 ME:PersonalName $a Personal name Litwin, Eric. $c Statement of responsibility by Eric Litwin; art by James Dean. 520 Summary $a Summary, etc. 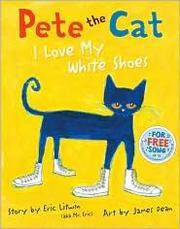 note As he walks down the street, Pete the cat sings about his brand new white shoes as they change from red to blue to brown to wet. 650 Subj:Topic $a Topical term Cats -- Fiction. 650 Subj:Topic $a Topical term Shoes -- Fiction. 650 Subj:Topic $a Topical term Singing -- Fiction. 650 Subj:Topic $a Topical term Optimism -- Fiction.